Ok, as you know I am a Chicago girl, and with Chicago being a serious pizza town, I have missed the gooey richness of a hot cheese pizza, deep dish or thin crust, it was all good! Since being diagnosed, I constantly see people asking for alternatives for pizza and I resisted making recipes because the consistency of the cheese was so hard to duplicate. 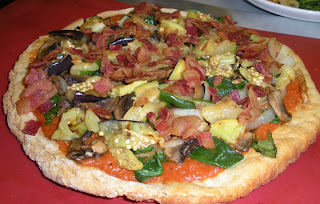 Well, I finally gave in, below find my version of allergen free pizza, yes free of the major 8 and gluten! With that said, I have a hard time calling it pizza without the cheese, but regardless of what you call it, the results were delicious. Making pizza requires a lot of prep work, so to make the task a little easier, I enlisted my friends at Whole Foods Market for the crust. They have a gluten-free, frozen crust (contains milk) if you are in a rush or they have several mixes for you to try, including Bob’s Red Mill. Make sure to read the ingredients so it will be safe for your family. Over medium high heat in a sauce pan, sweat onions, celery and carrots in olive oil, do not burn them. Add bay leaf, basil and oregano until fragrant. Add tomato paste and brown slightly. Add flour and cook for about 2 minutes. Add diced tomatoes and bring mixture to a boil, and then reduce to a simmer and add the chicken stock. You are going to reduce the stock down about ½ way and then blend the whole mixture in a food processor or blender. In trying to recreate the cheesy taste, I grilled all the vegetables before adding them to the pizza, below is a listing of the ingredients I used on each pizza, bear in mind you can shake it up however you like, these are just the things we like at our house. Assembling the pizza is easy, spread on the sauce and apply your favorite toppings, your oven temperature and cooking times will be dictated by the crust you choose. Don’t wait to get your tickets for our first Lisa Cooks Allergen Free Q&A Dinner at the Cooking and Hospitality Institute of Chicago on March 7, 2009, tickets are going fast, make sure to save your spot! The Q&A Dinner requires advanced registration and prepaid tickets, click here to purchase now. Peanut Free Planet is just one of the companies that are providing product for your family to try in our deluxe gift bag. Lisa sat down with the owners, Heather and Brian Selwa to learn a little more about their business. Q. What made you decide to start an allergen free company? Peanut Free Planet was born on a plane ride back from Edmonton, Alberta, Canada, to Indianapolis, Indiana. Brian and Heather had been married for 4 months and were visiting her family in Canada. Heather was packing a suitcase full of safe Candy to give to her patients and to give out for Halloween. Brian was confused as to why Heather was bringing 50 pounds of Candy back to the U.S., as he was sure Indiana had not run out of Halloween Candy. Heather explained to Brian the difficulty finding safe treats for Halloween in the U.S. Heather experienced several inconvenient food allergies in her life and has always had a soft spot in her heart for those with food allergies. Brian, who has a degree in Marketing, did the market research and found that not only was it difficult but there were not as many choices as in Canada for peanut free items. On the plane ride back, they decided they should start a company to provide safe snacks to those with allergies. Q. So does Brian have allergies? No, and that is good, because he can taste test products with gluten against their gluten free counterparts and make sure the taste is good, not just good enough. Q. What are your favorite products? Q. What new products should we look out for? You learn more about Peanut Free Planet and buy their products on their website at http://www.peanutfreeplanet.com/ and look on our website for coupons from Peanut Free Planet coming soon. 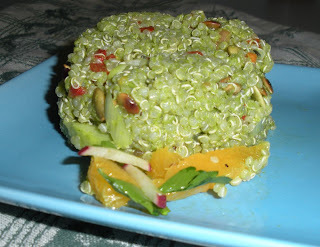 The Super Grain Quinoa has become highly appreciated for its nutritional value. It's high protein content, 12%–18%, and balanced set of essential amino acids make it a complete source of protein. Quinoa is also a good source of dietary fiber, phosphorus, magnesium and iron. Quinoa is gluten-free and considered easy to digest. If you haven’t tried cooking with quinoa before, don’t worry, it’s not hard and this recipe is worth it. 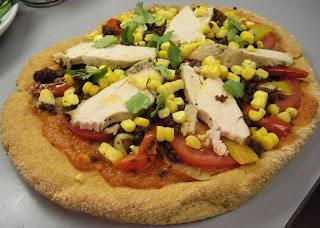 This recipe comes from the Cooking and Hospitality Institute of Chicago, it was so tasty, I had to share it with you. Enjoy! Mix all solid ingredients with vinegar in a blender and blend until smooth. Slowly drizzle in oil while continuing to blend. Add salt to taste. If dressing is too thick, add a small ice cube to thin the sauce. Add water and stock to sauce pan and bring to a boil. Add quinoa and cook until tender, you will see a small white line through quinoa that will tell you it is done. Toss lightly with dressing, and spread out and let cool. Once cooled, toss with remaining ingredients and dressing. Orange Radish Salsa - this is a great accompaniment to the quinoa, the orange adds a nice touch of sweet to the spice in the quinoa. 1 radish, cut into small strips, about 1/16"
Mix ingredients together and plate next to quinoa. In our house nothing says love like some fajitas! We love Mexican food and this is an easy and fast recipe for this family favorite. 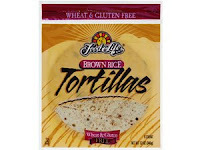 We use either corn tortillas or Food For Life makes a wonderful brown rice tortilla or just add the fajitas to some lettuce for a yummy salad. Don’t forget the guacamole and homemade salsa (find these recipes by clicking on them). Mix paprika, garlic powder, cumin, Kosher salt, ground black pepper and chili powder in a bowl and separate into two parts and set aside. Over medium high heat, sauté chicken with ½ of seasonings for about 7-10 minutes and remove from pan. 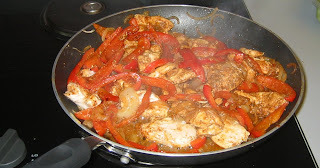 Add onions, peppers and garlic and sauté with second ½ of seasonings until vegetables are slightly soft. Add cooked chicken, and reheat in pan. Add to corn or rice tortillas with your favorite toppings. Have you been craving a delicious, crispy fried chicken dinner... but worried about food allergies? We've found something worth clucking about! Headquartered in Chicago's trendy West Loop Market district, you'll find Ina's, a longtime breakfast landmark, featured in The New York Times, Midwest Living, Gourmet, Bon Appetit, and Oprah.com. In recent years, owner Ina Pinkney (pictured left) expanded her menu to include an equally impressive line-up of luscious lunch and dinner options. The second Wednesday of every month, Ina's dinner menu now offers an out-of-this-world, gluten-free Fried Chicken special, which has fast gained legions of fans. We sat down with Ina's Manager, Seana Monahan, and learned about their special gluten free options. Q. Do you or your family members have food allergies? 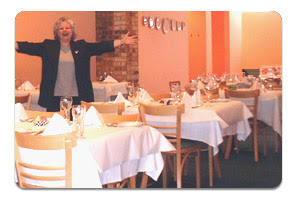 Ina’s has had customers with celiac disease enjoying meals at her restaurant for years. Seana has issues herself with wheat, MSG and refined sugars. Q. Do you get requests for other allergens to be omitted from your food? The most popular requests at Ina’s are for wheat and nut free products. Next up would be eggs. Q. What do you do to ensure no cross-contamination on Gluten-Free Nights? Seana takes personal responsibility in making sure the kitchen is sanitized and free of allergens. The oil is drained, and scrubbed 4-5 times and once the fresh oil is added, only the gluten free chicken can be made in the fryer. There is one person responsible for all gluten-free chicken and nothing else to ensure no cross contamination happens between products. The gluten free bread they serve (PanDeBono) is baked in a dedicated oven and the night of the dinner is overstaffed with managers and the staff is retrained before each dinner. Q. How do you get your chicken so tender and crispy? It took Ina’s 5 tries to get the recipe right with the help of a customer that is a food chemist. They also use the freshest chickens that can be frozen and reheated to taste like they are fresh out of the fryer. A lot of Ina's customers order extra chicken to do just that. 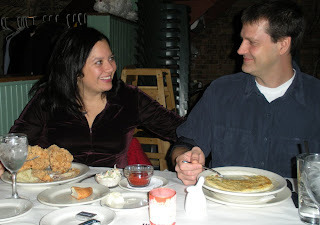 Myself and my husband, Mark, dining at Ina's.